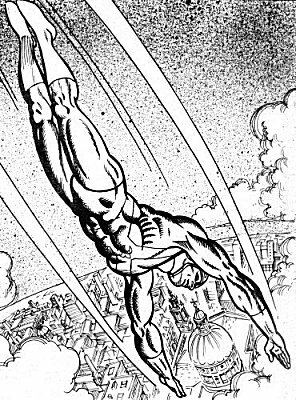 Powers/Abilities: Captain Granbretan, at least while wearing his costume, possessed the power of flight, heightened strength and a forcefield, presumably proportionate to Brian Braddock, the Captain Britain of Earth-616. He could fly in excess of the speed of sound, causing sonic booms in his wake. 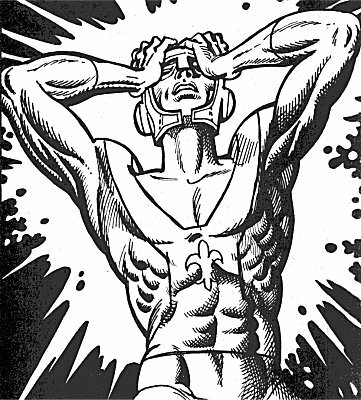 His powers were controlled telepathically, through a "lacework microcomputer", the use of which tended to give him a mild headache. History: (Captain Britain II#13 (fb)) - College student Paul Peltier was touring the circle of Neolithic stones known as Darkmoor when he discovered the uniform bearing the three colours of Granbretan draped over the centre stone. After donning it, the costume moulded itself to his skin and began to refine his physique and improve his musculature. Discovering the power of flight, Peltier embarked on a career as the superhero Captain Granbretan. 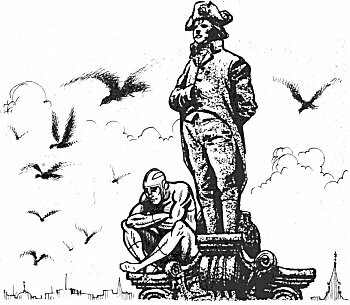 Peltier established a reputation as a hero, only to find compensations scant. After rescuing a man from a burning building and being asked how he could be repaid, he replied with a three-figure sum which was greeted with outrage. Women, similarly, tended to be too in awe of his powers to respond to amorous advances, and he found himself too exhausted to do anything about the few who weren't. As his dissatisfaction grew, his career took a downturn. Eventually the newspaper LONDRA MATCH ran a two-page article critical of Captain Granbretan, entitled "Head in the Clouds." His reputation plummeted, and the number of distress calls he received grew fewer and fewer. (Captain Britain II#13) - After a year and a half adventuring, and suffering from depression, Peltier decided to retire. He returned to Darkmoor intending to abandon the costume, only to discover his battlesuit had developed a sentience which had every intention of continuing on their superheroic career. The sentience began to move Peltier's body autonomously, ignoring his intentions and telepathic commands. Trapped within his own costume, he couldn't even scream, as the suit held his mouth closed. Captain Granbretan started on a new and more activist stage of his career, everything from foundering oil tankers, to rescuing kittens. The newspaper LE SOLEIL published a photograph of him rescuing a stricken Concorde, under the headline "Plane Sailing: Cap back in action." A few people noted the hero seemed to look pale and tired, but put this down to dedication to duty. (Captain Britain II#13 - BTS) - Eventually Peltier died, probably from a combination of exhaustion, dehydration and starvation. The costume however continued to animate his corpse and perform heroic deeds. (Captain Britain II#13) - After a period of time, Paul Peltier's body began to decompose. Sensing that it could no longer conceal the death of its host body, the sentience returned to Darkmoor. It digested Peltier's body and lay in wait for the next person to don the mantle of Captain Granbretan. Comments: Created by Grant Morrison and John Stokes. Presumably the sentience inhabiting the Captain Granbretan battlesuit is a similar program to that of Mastermind of Earth-616. The capital city of the Republic of Granbretan is Londra, where Paul Peltier often sat surveying the rooftops from the top of Napoleon's Column in the Rue Lafayette. Frequent tourists include those from the American Confederation (though it's not quite clear whether that's the name of the country, it could be the Confederated States of America or the United Confederacy of America or something). Some writers and artists on his Earth are still the same as Earth-Real: Les Smiths (The Smiths), Frank Sinatra, and Harold Pinter are all mentioned. Important newspapers include the LONDRA MATCH and LE SOLEIL. (Mighty World of Marvel (U.K.)#13) - Captain Granbretan attended Merlyn's funeral on Otherworld. (Excalibur I#44-45 - BTS) - Captain Granbretan attended the trial of Captain Britain-616 in Otherworld. (Excalibur I#125 - BTS) - Captain Granbretan joined his fellow Corps members in attending the wedding in Otherworld of the Earth-616 reality's Brian Braddock and Meggan. Paul definitely missed out being part of the massacre of the Corps in the second volume of Excalibur, since he couldn't have been killed in that massacre and also die in his own story. However it is entirely possible that his suit and new host didn't, and were thus destroyed with the rest of the Corps. Thanks to Loki for a colored version of Captain Granbretan's upper body shot from the Corps entry in Official Handbook of the Marvel Universe: Alternate Universes 2005 (November, 2005). All other characters mentioned or pictured are  and 1941-2099 Marvel Characters, Inc. All Rights Reserved. If you like this stuff, you should check out the real thing!